6 sizes available : 16-20-25-33-43-53 mm. A new concept, the company Sabbadini tourmaline brushes are designed and built for the convenience of use of the hairdresser, then equipped with soft touch handle and a renewed lightness. Sabbadini has innovated the combination of ceramic and tourmaline : tourmaline is an agglomeration of crystals which, when heated, naturally produce negative ions, so that the fusion of the tourmaline ceramic coating brushes generates negative ions. At the even distribution of heat through the ceramic, it adds a natural resource of negative ions for static and action for optimal results. 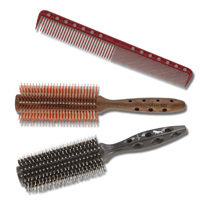 The cuticles of the hair are well-sealed, making it soft and shiny. 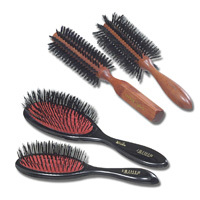 France's renowned quality brushes, made of boar or nylon foam. 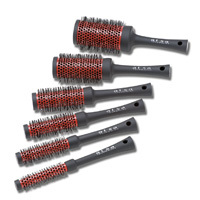 Even with continuous use, the bristles will not deform and the brush is clean. Large assortment of models.